[Courtesy of our friends at the New York Campaign for Telephone Justice] Thank you for all your support and participation in the campaign thus far. We made significant headway in 2006, and today we had a big victory – Governor Spitzer Ended the Backdoor Tax on NY State’s Prison Phone Contract, effective April 1, 2007. This victory is the result of your dedication and participation in this campaign. Please see below for details about Governor Spitzer’s actions and upcoming meetings on how you can help us move forward to permanently stop the contract. We will keep you up-to-date on the developments from today’s events, and please contact Lauren Melodia at [email protected] or 212.614.6481 if you have questions and to stay involved at this critical moment. ********************************************************************************************** VICTORY – Gov. Spitzer Ended the Backdoor Tax on NY State’s Prison Phone Contract, effective April 1, 2007 January 9, 2007 - Court Action in Albany at Oral Argument in telephone justice case Walton v. NYSDOCS GET INVOLVED – Upcoming campaign meetings Recent Press – Albany Times Union, North Country Gazette, Staten Island Advance, NY Daily News, New York Times. ********************************************************************************************** 1. VICTORY – Gov. Spitzer Ended the Backdoor Tax on NY State’s Prison Phone Contract, effective April 1, 2007 January 8, 2007 Albany, New York – Families in New York with a loved one in prison won a long-awaited victory today when Governor Spitzer committed to end the burdensome, back door tax on collect calls to inmates’ families. Since 1996, families of inmates have had no choice but to pay phone rates 630% the normal consumer rates to speak with their loved ones. And for the past 11 years, New York State has been collecting nearly 60 percent of the profits of these charges, $16 million in 2005. Family members have complained that the exorbitant phone rates forced them to choose between maintaining their relationship with a loved one and putting food on the table. Governor Spitzer declared that instead of raising funds via a backdoor tax imposed on the family members of inmates, the state will pay for mandated services in prisons using the State’s General Fund. Families should begin realizing savings in early April, when the General Fund will assume costs for these mandated services, including health care and family-based programs. “This is a victory for all New Yorkers because increased contact with family members is proven to reduce recidivism rates after release,” said Annette Dickerson coordinator for the NY Campaign for Telephone Justice on behalf of the Center for Constitutional Rights (CCR). “Everyone benefits when inmates stay connected to their families, and for most people this means contact over the phone. Governor Spitzer has demonstrated his commitment to civil rights. The unlawful tax was flatly unconstitutional.” “Thank you Governor Spitzer, you are righting a major wrong,” said Ivey Walton, a prison family member. “This contract was ridiculous and illegal. Soon, no one will be cut off from their family just so the Department of Corrections and some telephone company can make a profit.” “We commend Governor Spitzer for standing up for innocent family members and doing what’s fair for all New Yorkers,” said Alison Coleman, Director of Prison Families of New York, Inc. a partner in the campaign. “By halting this backdoor tax Governor Spitzer and his administration have effectively stalled the contract with Verizon from renewing automatically. We’re thankful that at last we have a Governor who is acting in the people’s interest, not defending corporate profiteering and the bureaucratic status quo.” 2. January 9, 2007 - Court Action in Albany at Oral Argument in telephone justice case Walton v. NYSDOCS On January 9, 2007 at 2:00pm, New York States’ highest court – the Court of Appeals – is set to hear arguments in Walton v. NYSDOCS, which argues that the current prison phone system illegally imposes an unlegislated tax on inmates’ families. The court could dissolve the contract and end the overcharging. If you are in or near Albany, join us as we show support during the Oral Arguments at: Walton v. NYSDOCS January 9th at 2pm State of New York Court of Appeals 20 Eagle Street Albany, NY 12207 Walton v. NYSDOCS was originally filed in 2004 by the Center for Constitutional Rights and seeks an order prohibiting the State and its contracted prison phone provider from charging exorbitant rates to the family members of prisoners to finance a 57.5% kickback to the State. Judge George Ceresia of the Supreme Court of NY, Albany County, dismissed the suit in fall 2004, citing issues of timeliness. In August 2005, the Center for Constitutional Rights filed and won an appeal in this case. 3. GET INVOLVED – Upcoming campaign meetings We need to make sure that Spitzer’s efforts today remain part of NY State law and that the exploitative contract is replaced with one that is fair and provides options for families. Please join us this month – during our monthly conference call or our monthly meeting – as we discuss critical next steps in the campaign to permanently replace the contract with one that works for families and loved ones! Tuesday, January 16, 2007 at 7:00pm EST NYCTJ Family Member Conference Call Folks are invited to participate in the call at 7:00pm Eastern Standard Time. Call Alison at 518.453.6659 or email her at [email protected] for the Toll Free Number. The Family Member Conference Call occurs every month on the third Tuesday of the month. Tuesday, January 30, 2007 6:00pm – 8:00pm NYCTJ Monthly Meeting 666 Broadway, Room 602 between Bleecker and Bond Streets. Meetings are open to all friends and family members of people incarcerated in NYS prisons, ally organizations, and anyone concerned about this critical issue. Light refreshments served. Email Lauren Melodia at [email protected] or call 212.614.6481 to RSVP. Our monthly meetings are held the last Tuesday of every month. Have You Warned Your Kids About Schwag? Next time you get "amped out" on "sextasy" and wind up in a "k-hole" don't tell your mom. Forbes.com has published a new drug-slang quiz for parents that totally lets the "cat" out of the "bag". If you're a parent, you might want to brush up on your drug slang to stay alert to possible drug use by your children, suggest addiction experts at the Menninger Clinic in Houston. Slang terms for drugs constantly change and evolve, the researchers said. For example, while marijuana is still called weed or pot by some, it's also referred to by newer terms such as chronic or schwagg. Are they serious? Dr. Dre’s marijuana-themed album "The Chronic" came out in 1992. And "schwag" of course is a derogatory term for really bad marijuana that’s been in use forever as far as I know. 2. The painkiller Oxycontin is also called: a) oxies; b) cotton. They say only (b) is a correct answer. So if your child asks to borrow money so he can get some "oxies" go ahead and help out. 6. Combining the prescription drug Viagra with Ecstasy is called: a) 24-7 heaven; b) sextasy. Answer: (b) Parents who’ve let their daughter go to "sextacy" parties will be shocked to learn the truth. But no, I don’t think we have to worry about Congress banning Viagra anytime soon. 8. Working Man's Cocaine is: a) crack cocaine; b) methamphetamine. Answer: (b). Meth users have jobs? I heard all they did was rob gas stations and pluck out their eyebrows. 10. "Juice" is the slang term for: a) steroids; b) PCP. Answer: both. So if you overhear your kid using the word "juice" they're either on steroids or PCP. The hard part is figuring out which. This is the sort of useless information one can expect from "addiction experts" who regularly turn out to know less about drugs than everybody else. Colorado ’s initiative would allow adults to legally possess up to an ounce of marijuana. That might not seem like much, but, in reality it makes between 30 and 60 joints. Whatever. An ounce is the same amount regardless of how many joints you intend to roll, and it’s not that much. If you’re rolling 60 joints out of an ounce, try smoking two or three of them. But watch out; large joints are two to three times more dangerous than small ones. US Drug Czar John Walters says legalization will inundate our drug treatment centers. No, it won’t. Most marijuana users who enter treatment programs are forced to do so by the criminal justice system. Ending misdemeanor marijuana arrests will dramatically reduce the number of people entering treatment for marijuana. And to the extent that fear of arrest is a primary motivation for some who decide to quit, legalization could reduce voluntary admissions as well. On the other hand, as my colleague Tom Angell pointed out in conversation, legalized marijuana will carry less stigma and could lead to more voluntary admissions from people who are finally comfortable admitting they’re having problems. If Tom is correct, we’ll end up with more people in treatment for marijuana who want and need it, and less people forced into treatment based on arbitrary criteria such as an arrest. Sounds good to me. This one’s actually true, but it’s his fault. Thanks to prohibition, marijuana sellers don’t have to check ID, making it the easiest drug to get if you’re underage. I just keep telling myself that this crap can’t go on forever. Whether we win in Nevada or Colorado next month, or somewhere else down the road, the war on marijuana is an ugly swelling pimple that’s almost ready to pop. Get it over with already. You know you want to. December 1, 6:30pm, New York, NY, First Annual Charity Dinner/Fundraiser for In Arms Reach: Parent Behind Bars: Children in Crisis, with former New York Giants linebacker Carl Banks. At the Great Hall of City College, call (212) 650-5894 for further information. Michigan is the latest, with Gov. Granholm signing a bill on Thursday that will make some meth offenses per se evidence of child abuse. I have a problem with these laws. I think child abuse is already well defined and people who fit the criteria should be punished for it. But saying that using or even cooking speed equals child abuse is just absurd on the face of it. I'll be talking to people through the week as I write a story on this to see if I'm wrong. Many DRCNet readers remember the heartbreaking tragedy of Rainbow Farm, the alternative campground and concert site outside Vandalia, Michigan, where marijuana activists Tom Crosslin and Rollie Rohm, driven to desperation by a relentless prosecutor, were killed by FBI and state police in fall 2001. Killed for no good reason -- as a local sympathizer expressed it to Drug War Chronicle's Phil Smith at the funeral, "[Prosecutor] Scott Teter said this was their choice, but it was his choice to hound them and try to take their land and their son. He's the one who chose to shoot and kill." Rohm and Crosslin before the end burned down their beloved buildings to keep the government from getting them. 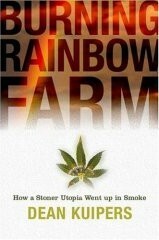 Journalist Dean Kuipers of the Los Angeles CityBeat has now written "Burning Rainbow Farm: How a Stoner Utopia Went up in Smoke," a 304-page book being released by Bloomsbury USA this June 13. DRCNet is offering "Burning Rainbow Farm" as our latest membership premium -- donate $35 or more to DRCNet, and we will send you a copy -- donate $45 or more and we will send you one signed by the author. Your donations will help our work to end drug prohibition, while raising awareness of the recklessness and excesses of drug enforcers like prosecutor Teter -- click here to donate and order your copy. Publishers Weekly writes of Kuipers' book, "Drawing on extensive interviews, government documents and news coverage, the author [who grew up 20 miles from the shootings] verges on portraying the prosecutor as evil incarnate. But Kuipers doesn't cross the line from sound journalism into advocacy, while letting the story unfold through superbly detailed characterizations and skillful pacing." Thank you for your support. If you want to read more about Rainbow Farm in the meanwhile, please see Phil's articles in the Drug War Chronicle archive: Michigan Drug Warriors Drive Marijuana Activists to the Brink, Then Gun Them Down on 9/7/01; Rainbow Farm Marijuana Activists Laid to Rest, Friends Not Resting on 9/21; and Phil's book review last week.